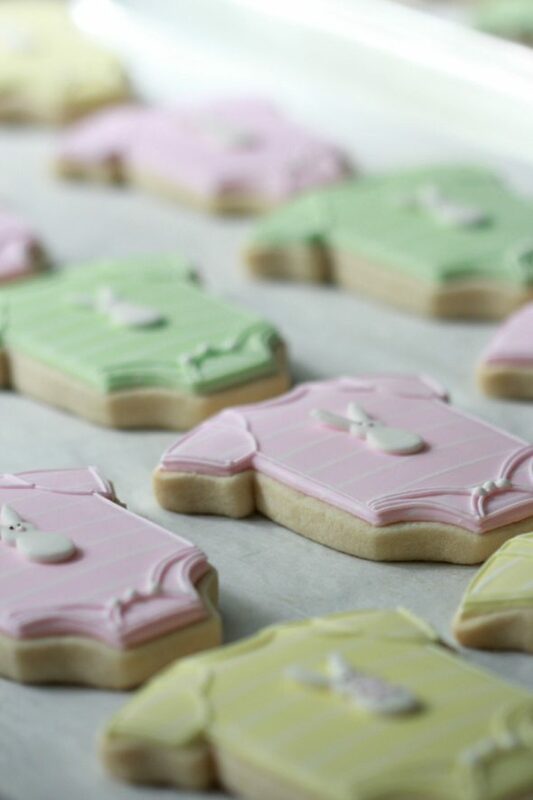 Pastel sweetness and baked with love – these baby shower cookies are super simple to decorate with a few key tips. If you’ve seen other tutorials here you’ll recognize the basics which I’ll share below, and, for all of you, new decorators or seasoned, I’m excited to share that I’ll be doing a giveaway for Peggy Porschen’s book, Cookies , in a few days. 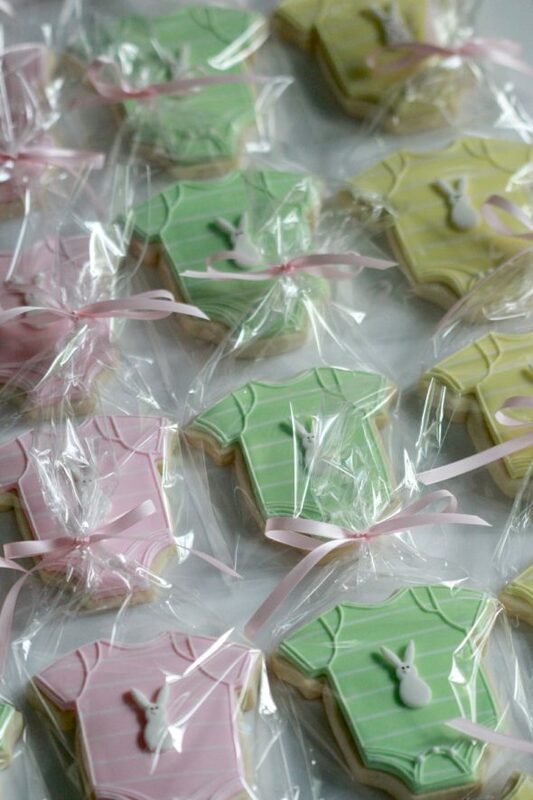 The onesie cookies here are based on Peggy’s cookies on the cover of the book. 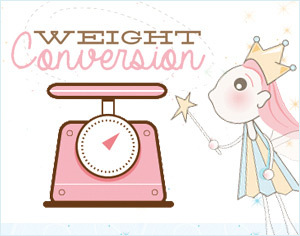 I fell in love with all her cookie designs and can’t wait to share the book with you! You can find the recipe for the dough here. If you’d like to try a different cookie base, other recipes can be found here. 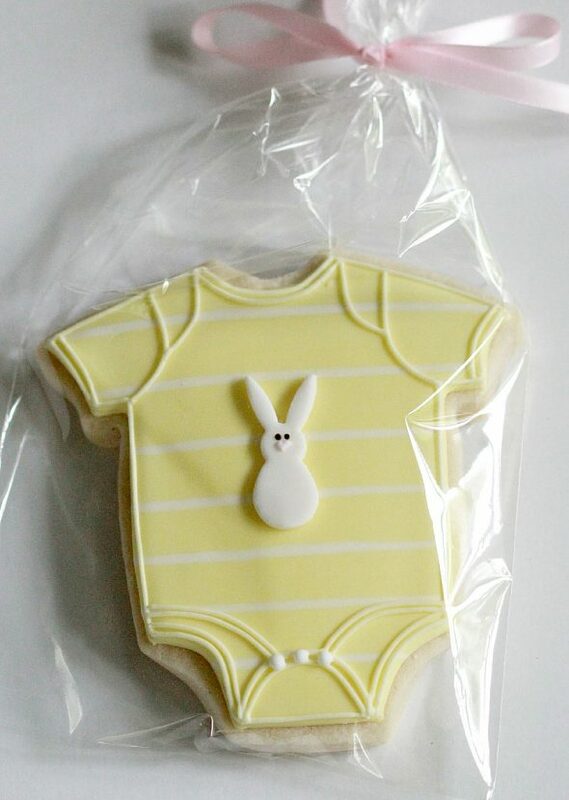 The onesie cookie cutter can be found here . 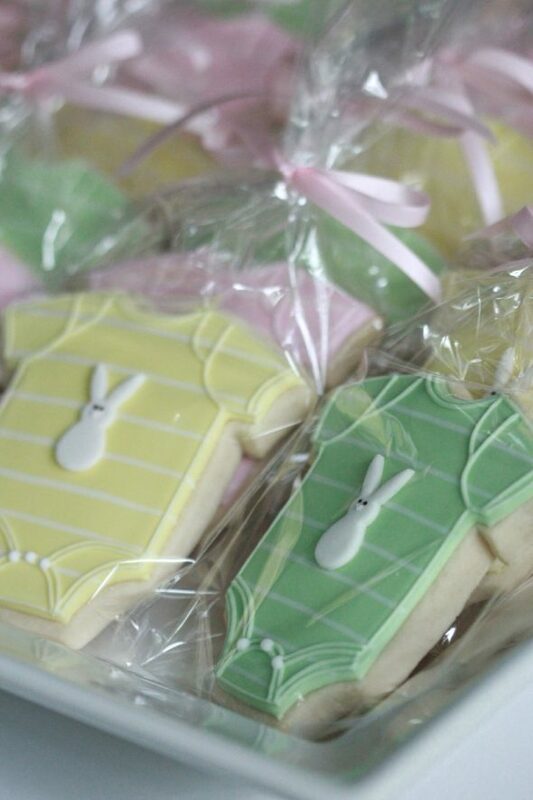 I used a fondant cutter to make the little bunnies, which I bought at How Sweet Is That and can be found here. 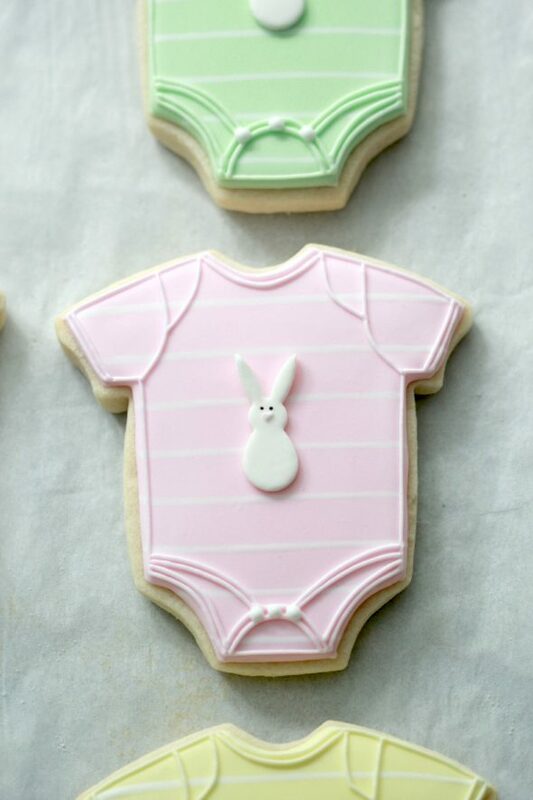 Step One: Using a #2 tip, outline the onesie shape with royal icing. For detailed decorating tips, this tutorial may be helpful for you. Step Two: With the same icing, flood, or fill in your shape. Step Three: Using a piping tip #1.5, pipe white lines on the wet icing base. Let the base dry for at least 6-12 hours. Step Four: Using a piping tip #1.5, add the finishing line details to the onesie. Step Five: Roll out your fondant to about 2mm thick, and punch out a bunny shape. 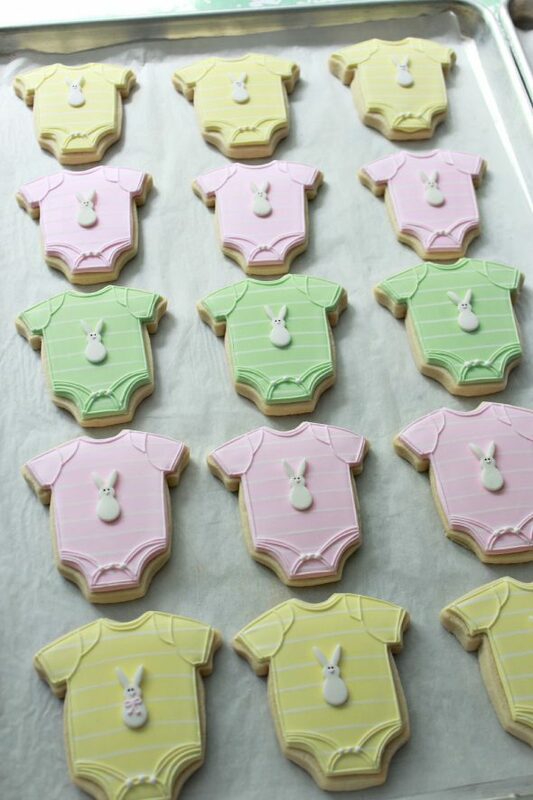 Let them dry for a few hours and then adhere to cookie with small dabs of white royal icing. Add the finishing details such as eyes, noses and 3 little white dots of icing for buttons. 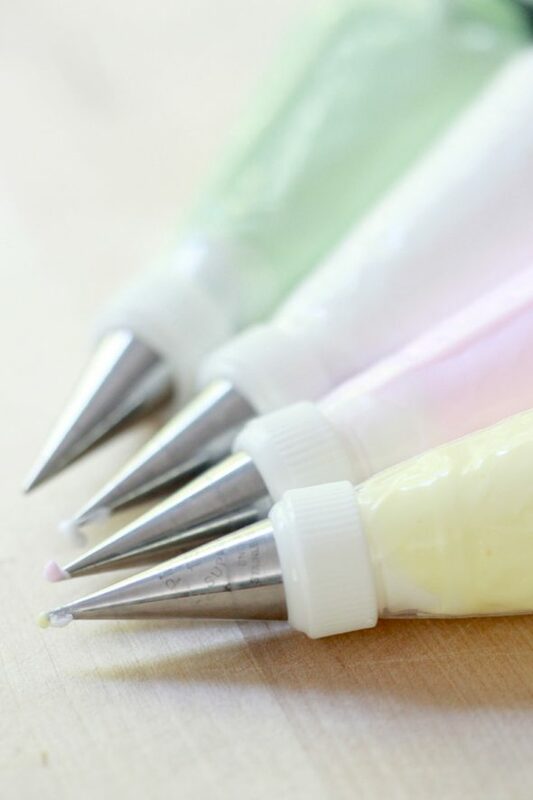 If you’ve never rolled out fondant before, here’s a basic how-to video for you. Once the cookies are dry, serve as is or package them in cellophane bags. Enjoy! 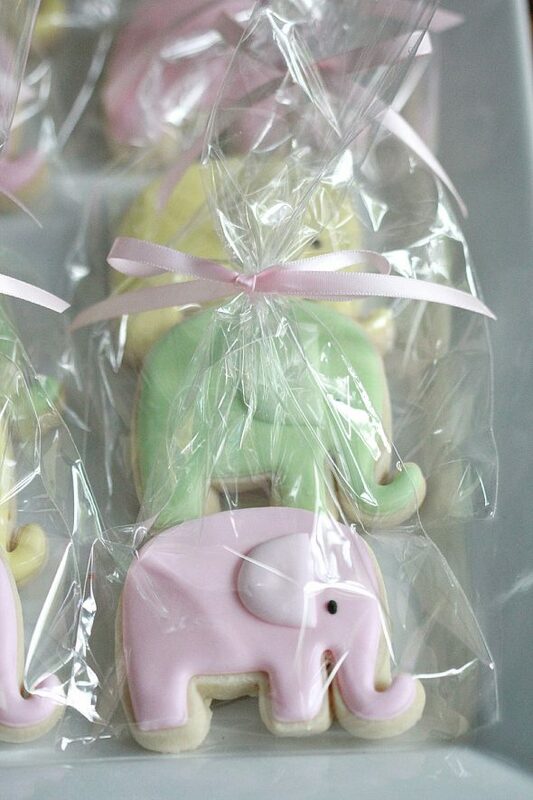 The same recipes and basic decorating steps as the onesies also apply to these elephant cookies. 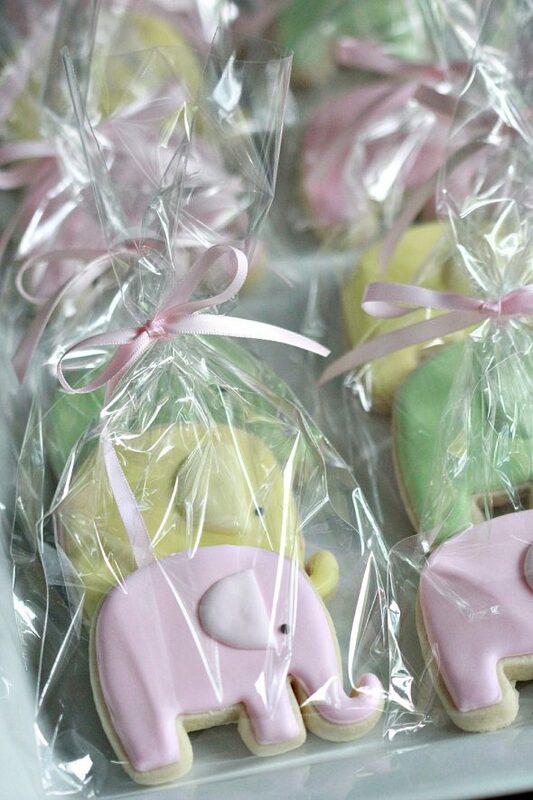 You can find a similar pictorial here; Elephant Baby Shower Cookies. 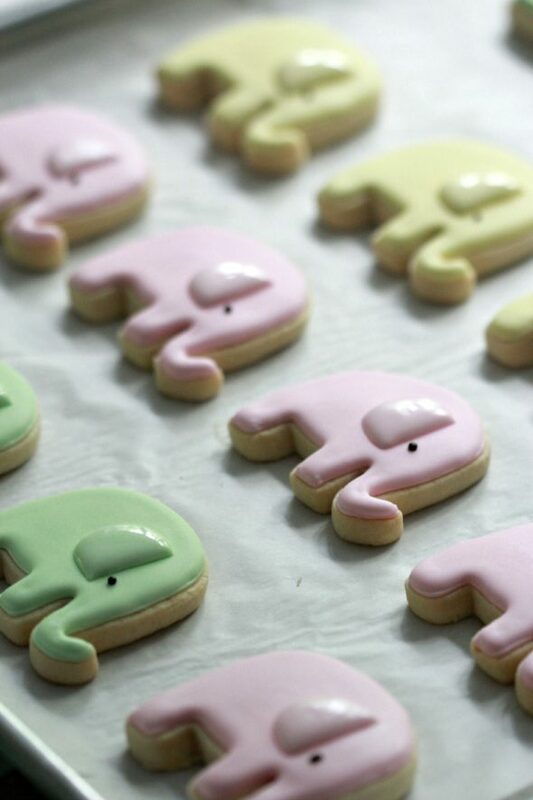 The small elephant cutter is from How Sweet Is That. 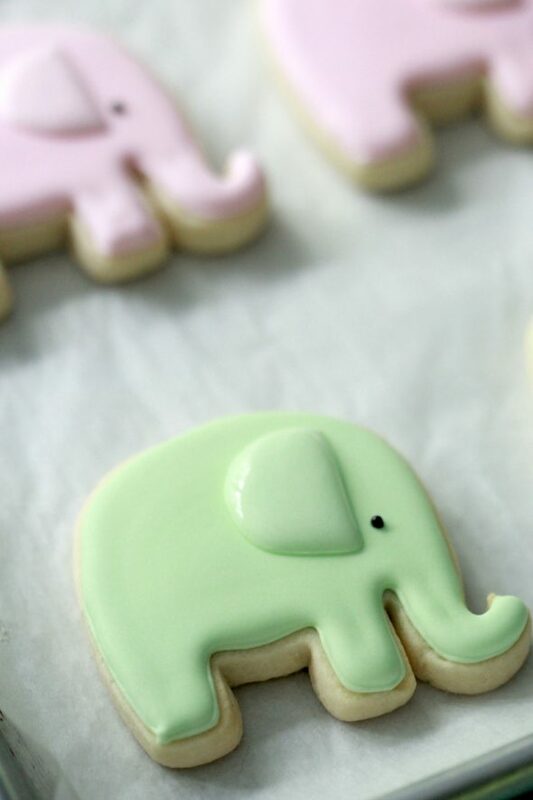 A question I’m often asked is how to keep the royal icing from drying to a matte finish. I’ve discussed the issue at the bottom of this post here, and would love your input if you’ve got more ideas! Beautiful! I just had a friend ask me to make shower cookies! Thanks for sharing your tips and ideas! Perfect! These are fun and easy to make Kim P! Marian, the gift God has given you amazes me everytime I see new creations from you. These onesies…are you kidding me?? SOOOO CUTE! And the fondant bunny makes it every more adorable and complete, and totally “you”, since you love bunnies so much. Hee hee, you noticed the bunnies. 😀 Thanks so much for your sweet comment Niner! These are so adorable! Thank you again for sharing your talent and techniques with us! Thanks for your kind comment Jeanette! Wowzas! Stunning cookies, Marian. Absolutely beautiful. You have serious talent girl! 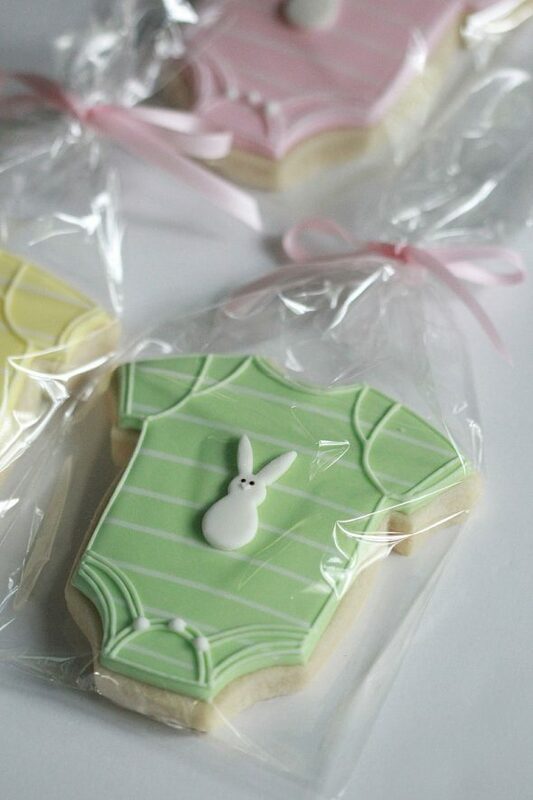 Marian, these cookies are so adorable! Really love them! Your work is always perfection! What is your prefered cookie to use? 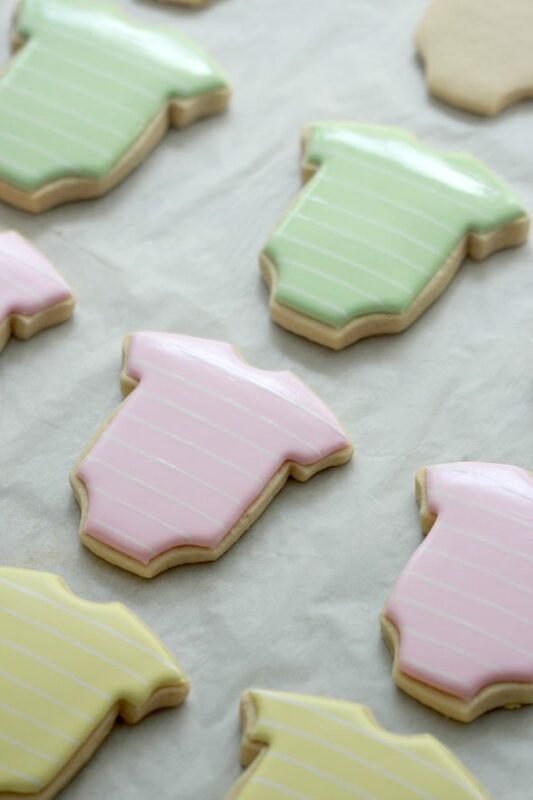 I like sugar cookies for soft colors like these pastel cookies, and gingerbread and chocolate sugar cookies for Christmas or stronger color palettes. All of my recipes are in the recipes section if you’d like to try them. 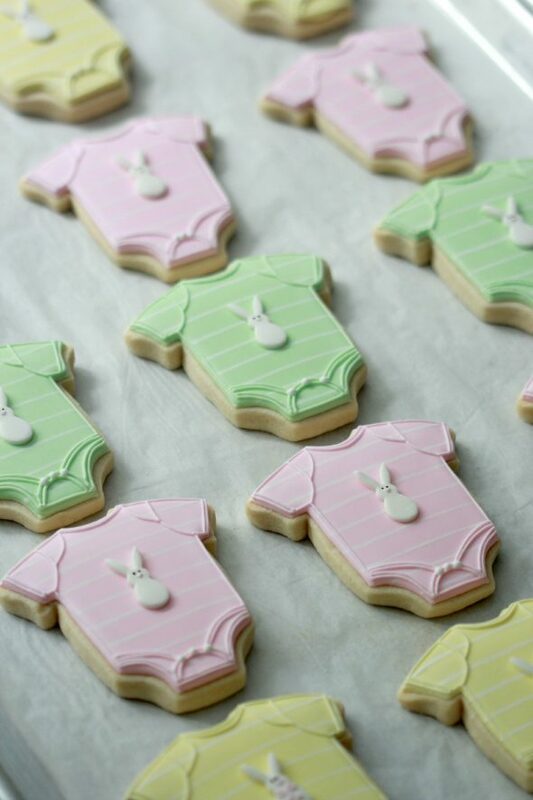 Adorable pastel cookies. I’m sure they were a hit at the party! They are so so cute!! I love them!! Marian, I am often without words when I see your creations. The detail is so lovingly attended to. Such talent! 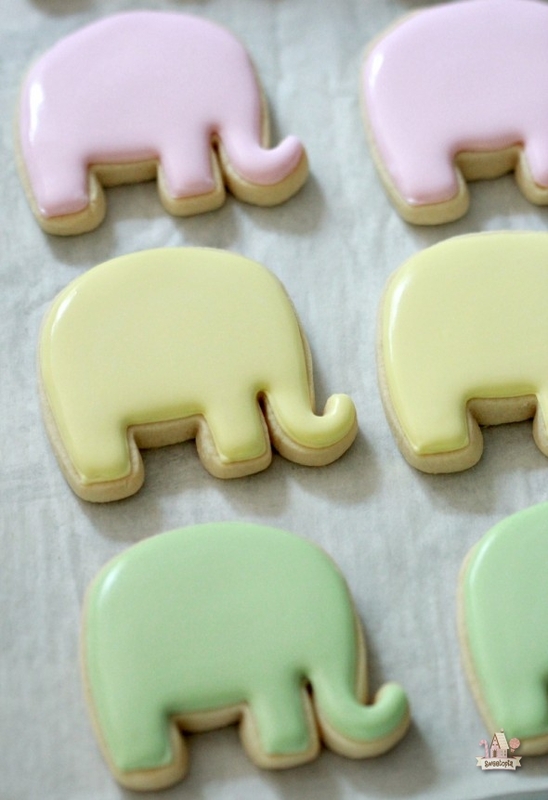 Which of your cookie recipes do you suggest as the one that best holds shape during baking? Thank you for sharing all you do. Sweetopia is such a bright spot for me. I love it all! This is perfect gift for my doll.I am sure she will like it.so easy to make. Thank you so much dear for this cute recipe. 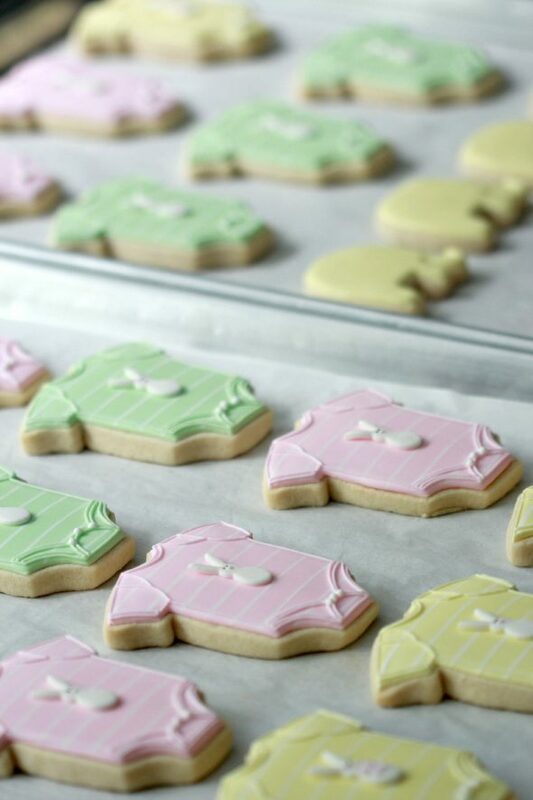 Wow cookies are amazing do you use a kopykake to make the lines on the onesie cookie. HOW on earth do you get your lines so straight??? I have a video where I show how to pipe lines if you’re interested. I keep my arm resting on the table which helps a lot. Love the colors! How you do achieve that green color?